Erasing everything that went before. But you no longer reach towards it. 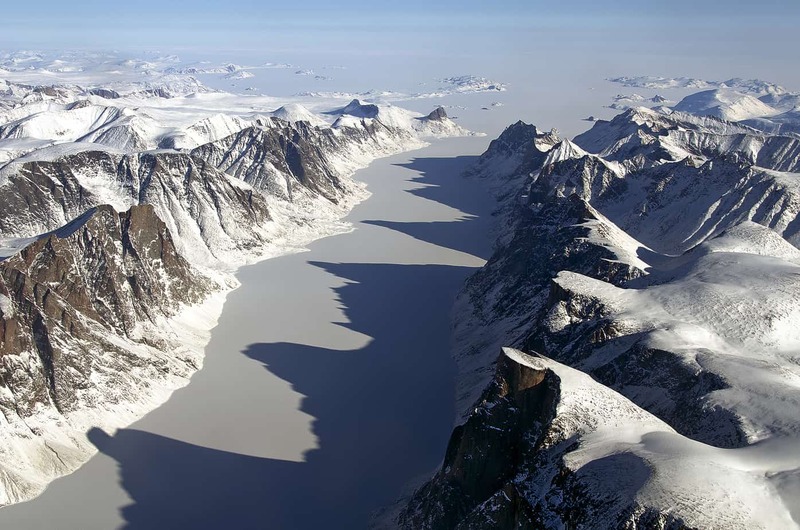 Ice covered fjord on Baffin Island with Davis Strait in the background (Photo Credit: NASA ICE). This poem was inspired by recent research which has shown that glacial retreat in the Canadian Arctic has uncovered landscapes that have previously been covered in ice for more than 40,000 years. Baffin Island, located in northeast Canada and to the south of Greenland, is the fifth-largest island in the world. Most of Baffin Island lies above the Arctic Circle, where the extremely cold temperatures mean that many ancient plants have remained frozen in ice for many thousands of years. As current global warming causes sections of the ice to melt some of these plants are revealed. By sampling these newly exposed plants and dating them using radiocarbon techniques, scientists can pinpoint the last time the sampled area was not under ice. In this recent study, researchers used such an approach to determine the ages of plants collected at the edges of 30 ice caps on Baffin Island. Once the samples were processed and radiocarbon dated, the results indicated that the ancient plants at all 30 of the sample sites were likely to have been continuously covered by ice for at least the past 40,000 years, until now. When compared against temperature data taken from Baffin Island and Greenland ice cores, these findings also suggest that the region is currently experiencing its warmest century in 115,000 years, and that Baffin Island could become completely ice-free within the next few centuries. Thank you very much for this poem! I am a photographer, and at the moment working on my new project about climate change. As I stumbled upon this writing, I felt very inspired, visualizing the words reflecting in my images. Good luck in your project!